"The Barong play represents a fight between good spirit and evil spirit. Barong is a mythological animal that represent a good spirit and Rangda is a mythological monster that represent an evil. 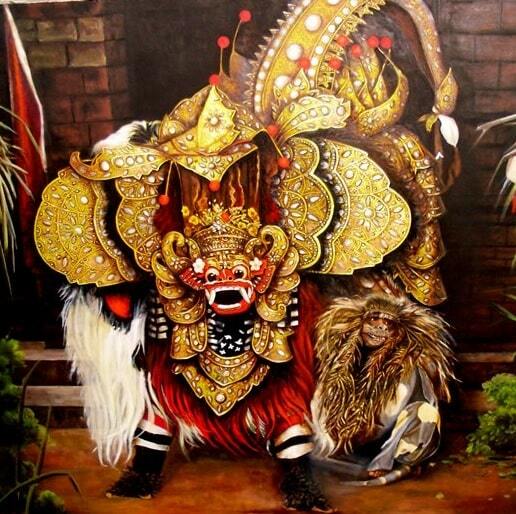 The Barong Dance is often portrayed with two monkeys and is probably the most well-known dance in Bali." The Barong dance is the classic story of good (The Barong) triumphing over evil ( The evil witch Rangda). The Barong is a large lion type creature played by two men, Rangda is the epitome of evil with long fingernails and droopy breasts. The Barong is going about his business until he is interrupted by Rangda. Ultimately a battle ensues and the Barong�s followers begin attacking Rangda with their Keris (daggers). Rangda, being a witch, is able to use magical powers to turn the daggers against their owners, who fall into a trance and try to stab themselves. The Barong dance is performed when there is illness or misfortune in the village and there is therefore intended to dispel this "evil forces". People gather together at the mortuary temple, Pura Dalem. Women are carrying the offerings. At the temple beautiful umbrellas are used. If illness or adversity prevails in the village, the dance is performed. Evil spirits and demons come from the direction of the sea to the village. By replaying the story of the widow Rangda and Barong again, the harmony is confirmed in the cosmos. The fight will end undecided. The Barong is a figure which is used to expel evil. 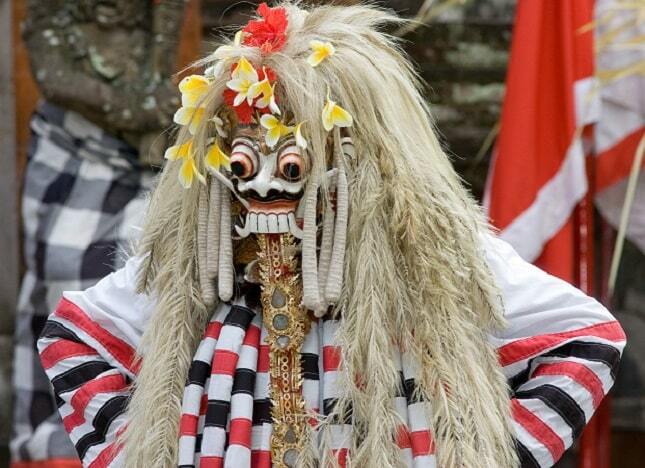 The Barong is usually played by two men, wearing a creepy mask lion. He rattles constantly from his mouth and embodies the good. His opponent is the wicked witch Rangda with frightening eyes and hair. The dance is meant to dispel evil. There's not a good explanation of the meaning of the word Barong. However, the Barong has a second name, namely Banaspati Raja (King of the jungle). The classic Barong is the Barong Keket. 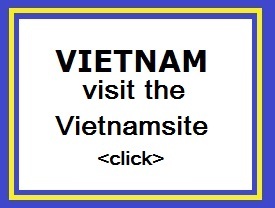 This does not correspond to any animal. Besides, there are two other forms: Barong Berutuk (young men, wrapped in banana leaves with a mask) and Barung Landung (two giant puppets, performing a dialogue and singing folk songs). 1) The first Barong version, where we known a little about, is related to Bedulu, which was probably the capital of Bali. The gods ordered the people to make a Barong to free the island of the plague. On Galungan (the largest Balinese holiday) the Barong had to go around to receive offerings and money. 2) In another story, the Barong is connected to the demon Jero Gede 'Mecaling. This demon came like a Barong with his followers to destroy everything on Bali. A priest said that only a similar Barong with followers could dislodge them. This was done and the Barong could therefore be used to chase sickness and evil forces away.